These vacuum sealer bags can be used for storing a variety of items such as: Seasonal Clothing, Blankets, Hand-me-down clothes and any soft-goods you can think of. They can also be used to store clothing and blankets in your car for travel emergencies. 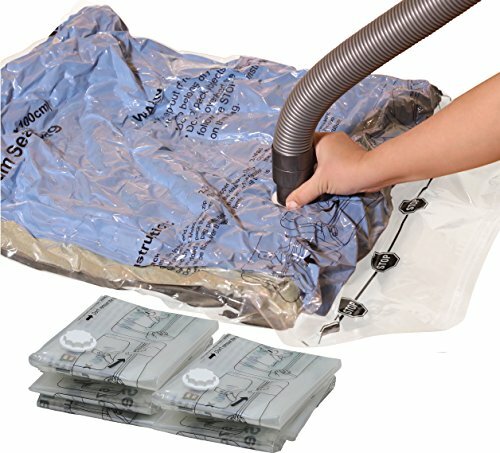 These bags protect your items from dirt, dust, bugs, and moisture; vacuum-sealing drastically reduces the effect of oxidation and retards growth of mildew. It's REUSABLE and SPACE REDUCTION UP TO 80%. Note: To ensure better sealing performance, please slide the zipper across the bag 2-3 times and use your hand to press the sealing line. After, vacuum out the air, then tighten the cap and make sure the rubber stopper is fitted. DO NOT store the bag near sharp objects. REPLACEMENT GUARANTEE: If you bag don't hold or seal, contact us for free replacement! !